The cellar of a building that during Nazi Germany's occupation of Poland in World War II was used by the Gestapo as a remand prison. A few of the cells have been preserved and together with some information material form another one of the city of Warsaw's rather grim museums (see also Pawiak). More background info: The Nazis' secret police, the Gestapo, was rightly feared. Their ingeniously sinister interrogation techniques and overall brutality are infamous. 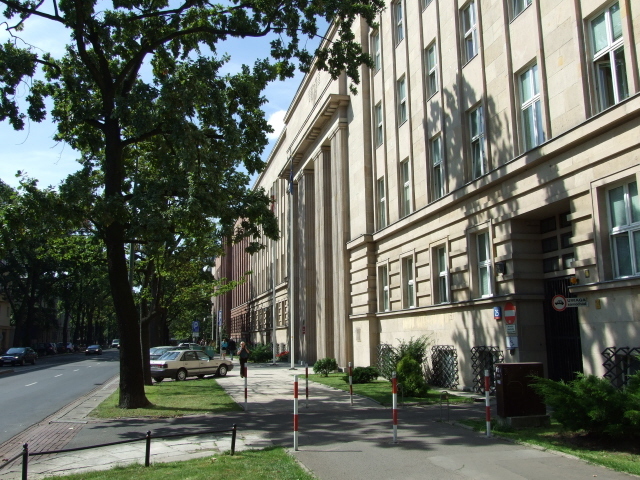 In Warsaw, the Gestapo primarily occupied a building as their HQ in the south of the city, namely on the street called al. Szucha, which was also the designation used for the prison itself. In the cellar they had a series of prison cells. And these were put to extensive use, mainly to hold members of the Polish resistance or other such suspects and "undesirables", where they would also be subjected to all manner of torturous interrogations. Little wonder then that many did not survive detention at Szucha. Today the building is part of a complex of guarded government buildings, but the cellar housing the museum is freely accessible to the public. Officially the place carries the name of "mauzoleum walki i meczenstwa", i.e. it is considered a "mausoleum of struggle and martyrdom'. This is a common descriptive phrase for such places in Poland. But it really is a just museum; nobody is buried here. What there is to see: Not all that much, but what is there is rather grim. As you enter the building you go down the wide steps into the cellar, from where two narrow corridors branch off. 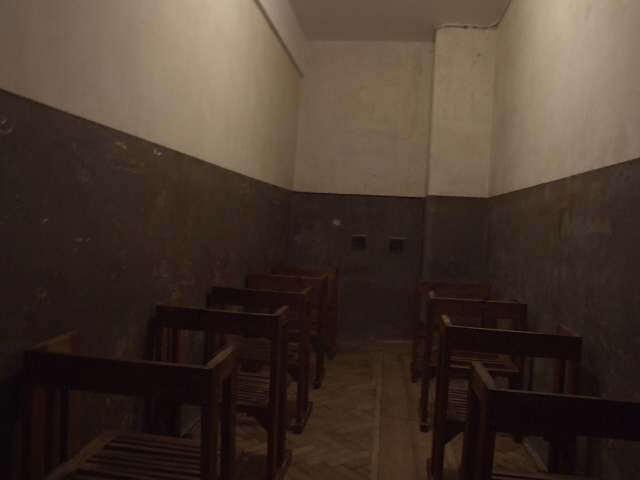 Along one of these, a row of original prison cells have been preserved, some still complete with metal shackles set into the floor, and one in the form of what the Nazis called "Straßenbahn" ('tram') with rows of wooden seats in which inmates had to await their turn to be interrogated. There is also a reconstruction of an interrogation cell, though originally these would have been upstairs. 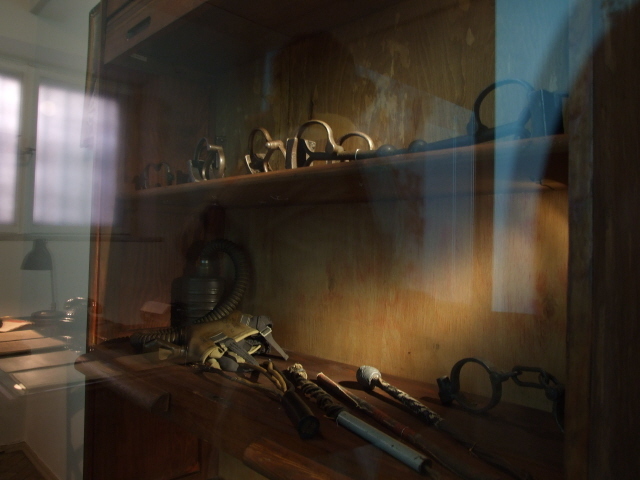 A collection of torture instruments is on display as well. The other corridor is rather bare, but a series of interactive computer screens affixed to the wall provide further information (in either Polish, English or German). In fact, such a wealth of information is presented at these stations that it is hard to get through it all, especially given that you have to stand in front of the screens the whole time. It is certainly a special-interest museum only, not for everybody. But if you do want to get a comprehensive picture of the dark period of war-time Warsaw under German occupation, this place is well worth the visit. Location: in the south of Warsaw, at 25 al. Szucha, also known by its longer name of Aleja Jana Chrystiana Szucha, about one and a half miles (2.5 km) from the central landmark of the Palac Kultury i Nauki. Access and costs: a bit out of the centre of town, but not difficult to get to; free. Public transport options are also plentiful, either by tram (Lines 2 and 4) or by bus (No. 112) down Marszalkowska, or one of the buses (e.g. No. 116 or 122) that go all the way to/from the centre and the Old Town. Opening times of the museum: Wednesday, Thursday, Friday 9:30 a.m. to 5 p.m., Saturday/Sunday 10 a.m. to 4 p.m. – closed on Mondays and Tuesdays! Time required: Just having a look around and peeking into the preserved prison cells and displays of torture instruments takes no more than a quarter of an hour – but you could spend up to a further hour or so at the interactive computer screens (wear comfortable shoes because there's nowhere to sit down in the museum). Combinations with other dark destinations: in general see Warsaw. There's nothing else of 'dark' interest in the immediate vicinity of Szucha, but several buses from a nearby junction at Plac Na Rozdrozu take you all the way to the centre, along Nowy Swiat and Krakowskie past the Old Town, and even further on to the Warsaw Uprising Monument. The grand boulevard of Marszalkowska begins just around the corner from Szucha and is in itself worth a look for its Stalinist era statues and reliefs on a few buildings, especially a bit further north at Plac Konstytucji. Trams running along Marszalkowska can take you straight to the Palac Kultury i Nauki. West of this some Ghetto Wall fragments (see Ghetto Trail) can be found. Thematically the Szucha museum perfectly complements a visit to the Pawiak prison museum (for directions/details see its own entry) – conveniently, you can get into both on the same ticket. Combinations with non-dark destinations: in general see Warsaw – the museum is close to the botanical gardens and Park Lazienkowski with the Palac Belweder. Public transport (see above) provides easy access to the city's more centrally located sights.